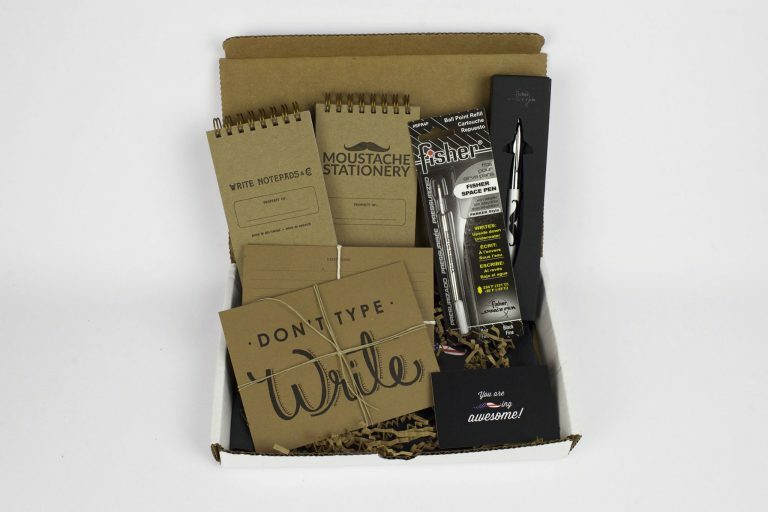 Moustache Stationery Box is filled with high quality stationery products such as heavy stock paper, unique pens, and other essential items to make your next writing project fun and creative. Each month’s box has a theme, and it’s a surprise! The box theme changes after the 20th of each month. 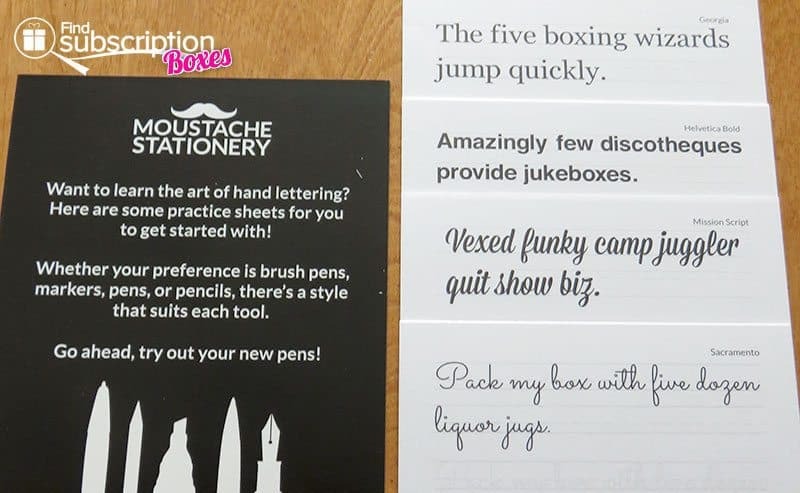 Moustache Stationery curates from all over the world to bring you the best stationery from independent producers and custom-designed items exclusive to Moustache Stationery. 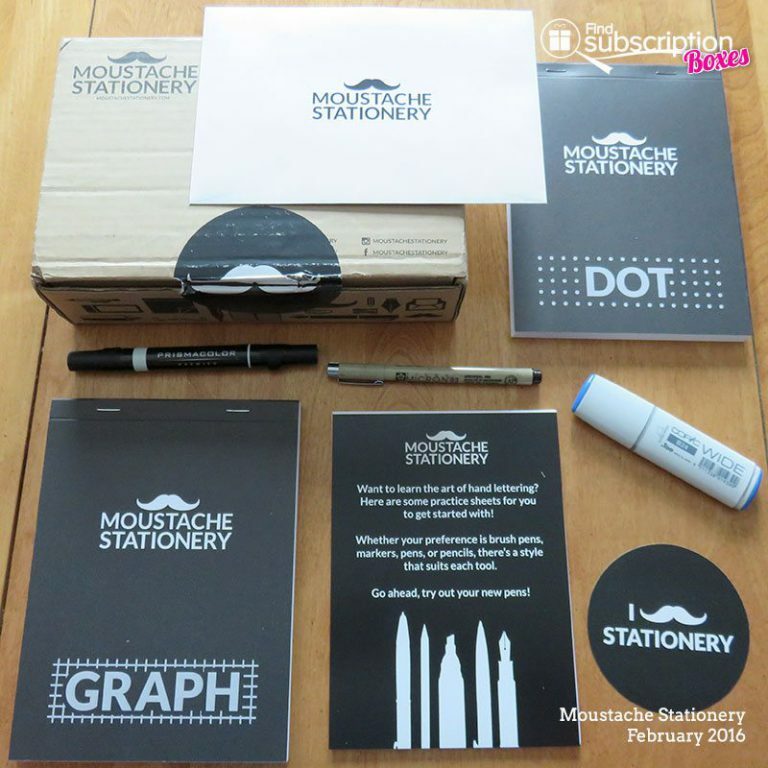 I received the February 2016 Moustache Stationery Box which was themed “Hand Lettering”—a very hot trend at the moment. 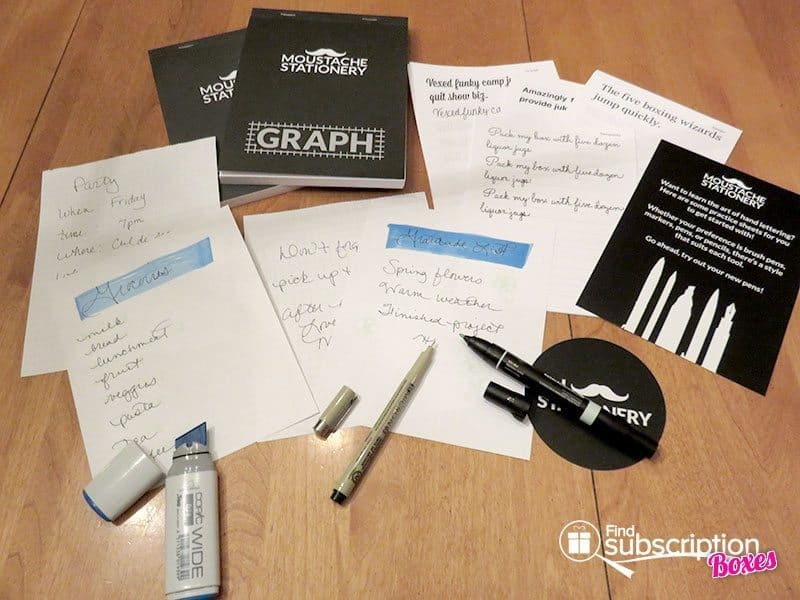 It contained two, quality note pads: one had a graph grid, and the other had a dot grid. The pads were Canadian-made. Pens and markers by Prismacolor, Copic, and Sakura. And sheets to practice hand lettering in multiple fonts. 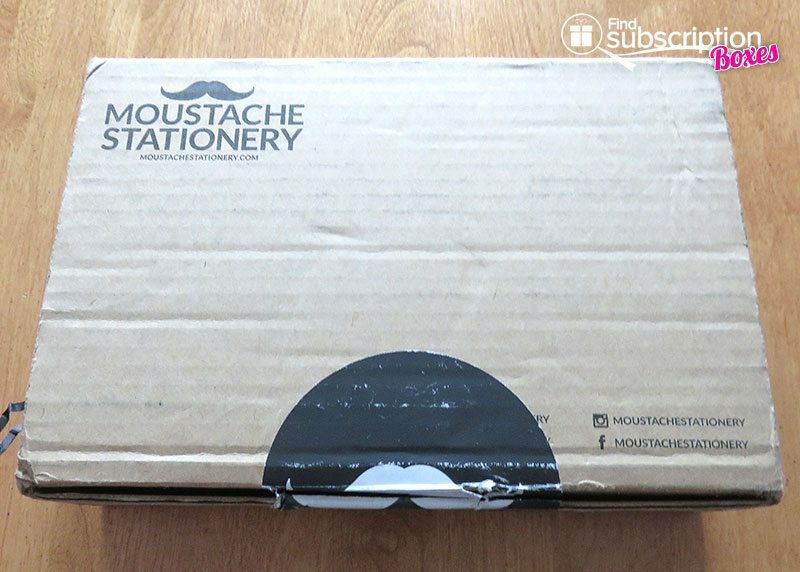 Plus there was a fun Moustache Stationery sticker. 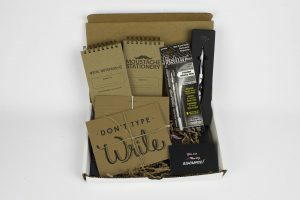 Additional supplies can be bought on the website, but the box was filled with the essentials for hand lettering. It was fun playing with the different products, practicing with different fonts, and using the pens and markers to enhance my work. I can’t wait to see what’s in the next shipment. The website has a lot of useful information regarding the products, a blog with fun information, and a shop to buy extra supplies if you need them. The monthly subscription is $39.95, shipping is free to the US, $5 to Canada, and $10 to the rest of the world. 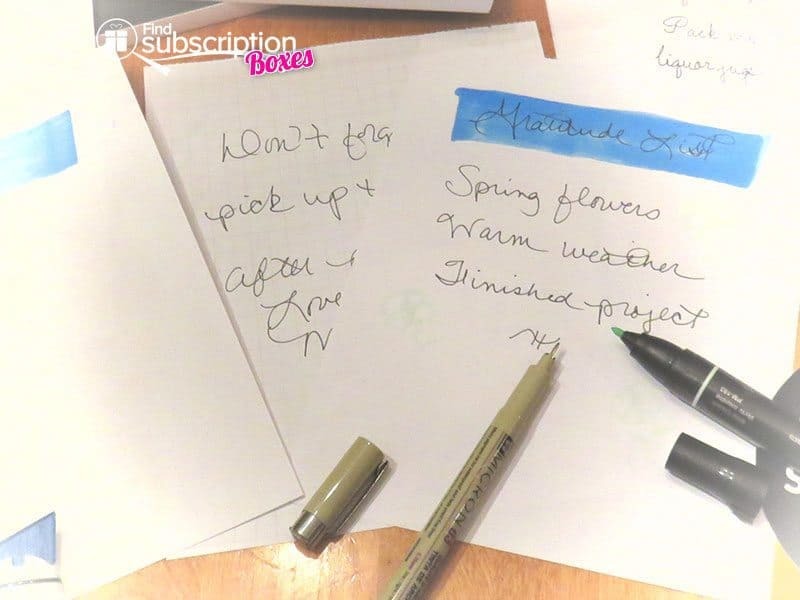 The subscription box can be canceled at any time.